All images on this page ©2004 The Regents, University of California; all rights reserved. For exploring models of large molecular complexes. Example systems are viruses and chromosomes. Goal is to provide capabilities in Chimera to explore systems where both large scale and atomic scale structure is important. NCRR research project - "Analyzing molecular complexes at multiple resolutions". Collaborating with Wah Chiu at Baylor College of Medicine on electron microscope studies of viruses. Collaborating with John Sedat at UCSF on electron and light microscope studies of chromosomes. Will show 4 example systems and demonstrate current Chimera capabilities. Picture shows ribbon diagram of one unit of icosahedral particle and surfaced representation of another unit. Making low resolution surfaces is done by multi-scale extension. Multi-scale extension makes 60 copies of unit cell to show virus particle. Outer layer has 260 trimers of VP7 protein in 5 symmetry classes. Inner layer has 60 dimers of VP3. Computer view of virus architecture shown in diagram. Not all of this architecture is in computer readable form from PDB entry. To hide outer layer computer must know what "outer layer" is. Multi-scale extension focuses on encoding and using this hierarchical structure information. Why Look at Full Virus? 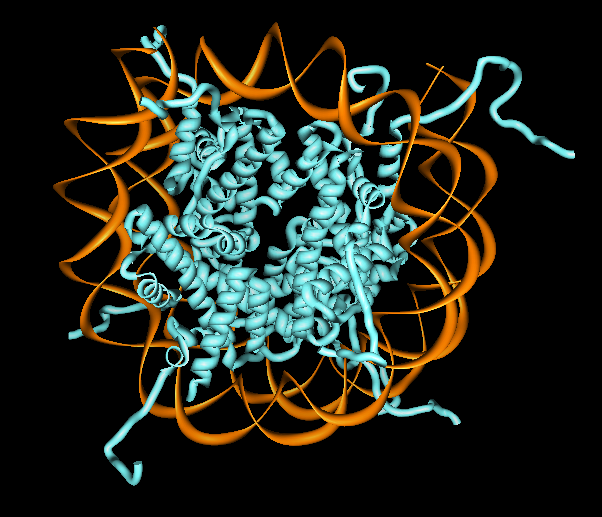 Image shows viral dsRNA attached to outside of virus particle. Thought to be a means to sequester excess viral RNA to avoid cell shutdown. Atomic scale and large scale useful for studying stickiness of shell and RNA. 60% of RNA / trimer contacts are with 5 polar residues. Work published by David Stuart's group at Oxford, September 2002. Show selection of outer monomer with mouse. Show selection promotion to trimer and trimer class. Show hiding trimers around 5 fold axis. Show all except half of outer layer. Show inner layer monomer as ribbon. Show other inner layer monomer as ball and stick colored by element. Use near and far slice planes to show thinness of inner layer. Creates low resolution surface depictions. Creates multimeric complexes from monomers. Allows both atomic and surface display styles. 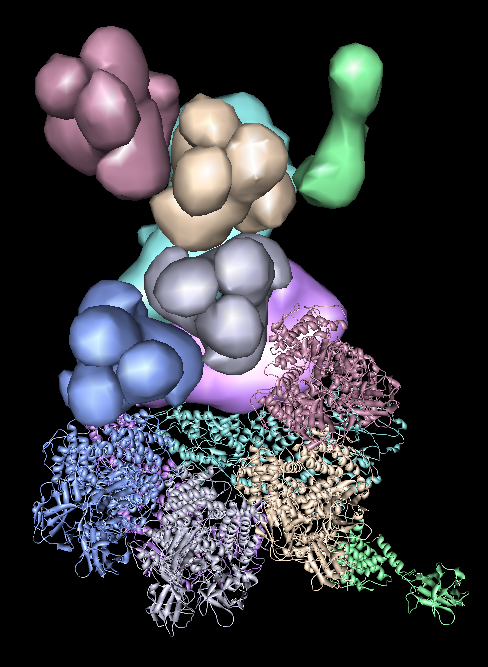 Models made automatically from PDB chains and matrix transformations. More control specifying higher levels of structure using Python script. Select chains with mouse and promote selections. Selections control what is displayed, display style (surface, ribbon, ...), and colors. Adjustable level of detail effects all surfaces. 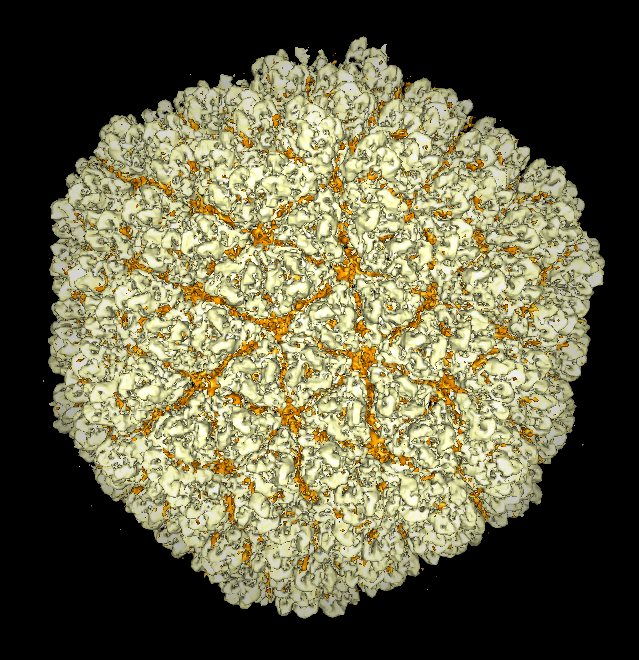 Rice dwarf virus is in the same family as Bluetongue virus (reoviridae). 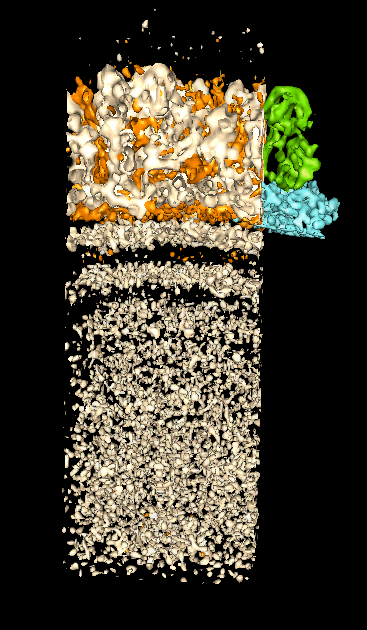 Core particle has 2 layer shell and dsRNA genome. Crystal structures of shell proteins have not been determined. Density map from electron cryo-microscopy of 3261 full virus particles from Wah Chiu's lab. Density map is hand segmented into layers, trimers, dimers and monomers. Averaging outer layer P8 monomer EM density gives 7 A resolution. 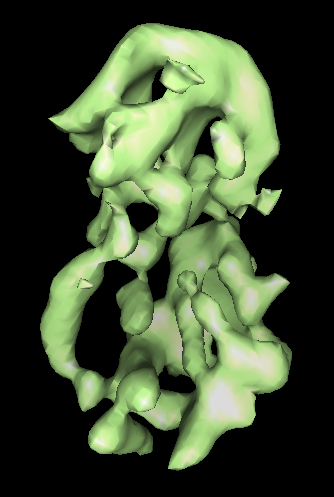 Secondary structure (alpha helices and beta sheets) visible. Pictures: full particle, inner layer dimer, shell and dsRNA strata, outer layer trimer, outer layer monomer. Multi-scale model can consist of components that are segmented regions of EM density map. Modeled backbone trace can also be a component. Structure components can contain atomic models, X-ray density maps, EM density maps, secondary structure tracings, theoretical models (eg. dsRNA genome packing). A multi-scale model component can contain more than one type of data. These systems provide beautiful high resolution publication images. 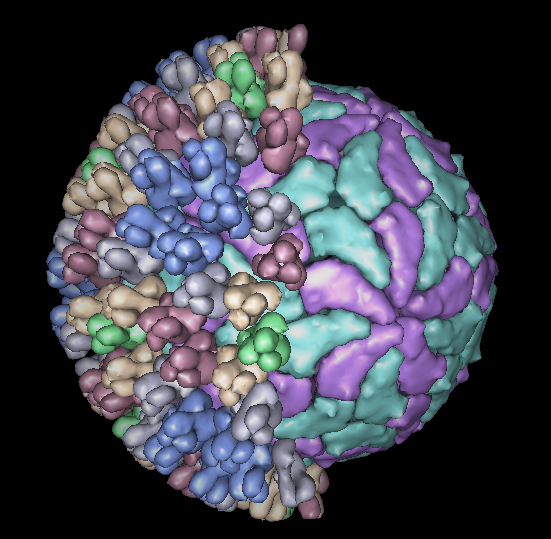 Radially colored density maps of viruses are common. 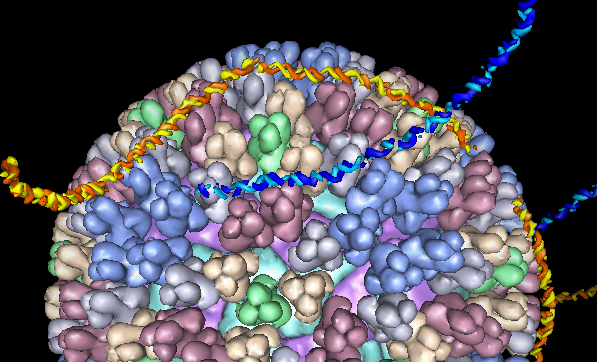 The graphics are typically molecular surfaces that render too slowly for use in interactive analysis. These programs do not understand the different structural levels of large complexes which limits their usefulness for interactive analysis. DNA in eukaryotes is usually packaged as a 30 nm fiber called chromatin. 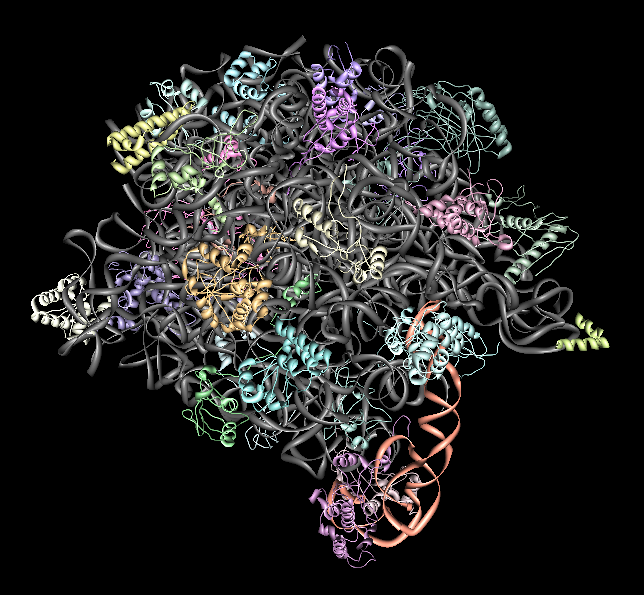 Fiber is composed of nucleosomes and accessory proteins. Nucleosomes consist of a histone protein octamer wrapped with ~2 turns of DNA, about 200 base pairs. 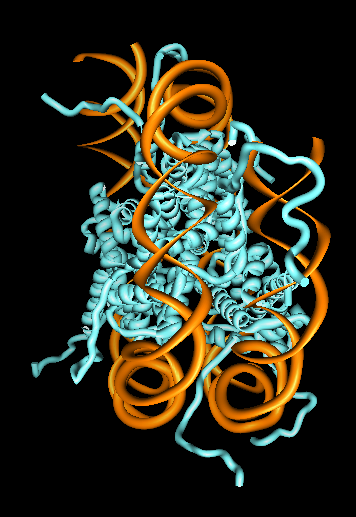 Nucleosome crystal structure is shown. 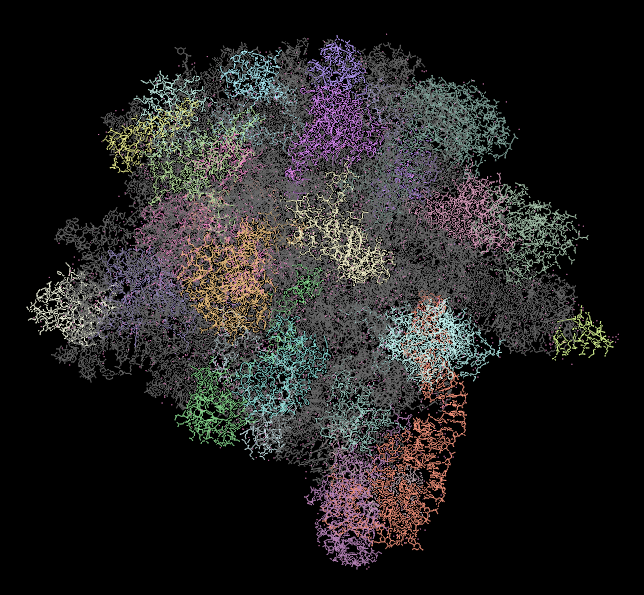 Conceptual model of fiber with 100 nucleosomes is shown. Detailed structure is unknown. 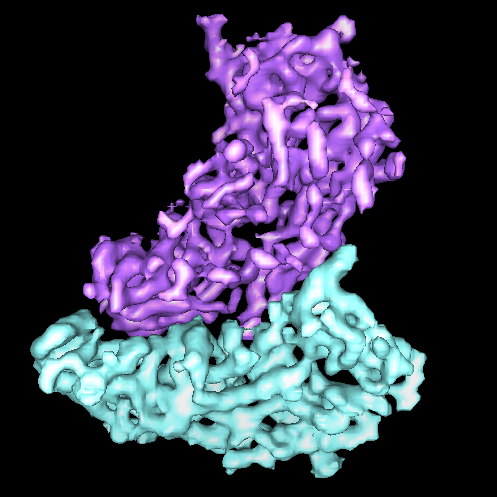 Histone tails thought to hold chromatin together. Showing nucleosomes as pellets provides clearer view of chromatin model than more detailed rendering. User specified geometric representations could be supported. A single user specified triangle could represent a virus shell trimer. Need control over which level of structure hierarchy gets surfaced. Surface resolution needs to be adjustable to not overwhelm graphics hardware. 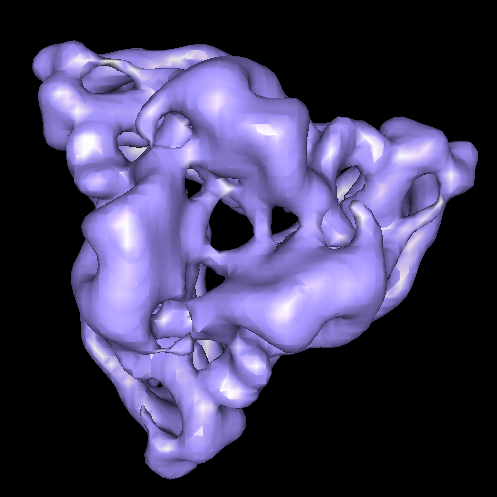 PDB model 1jj2, 30 different chains, 90000 atoms (no hydrogens). 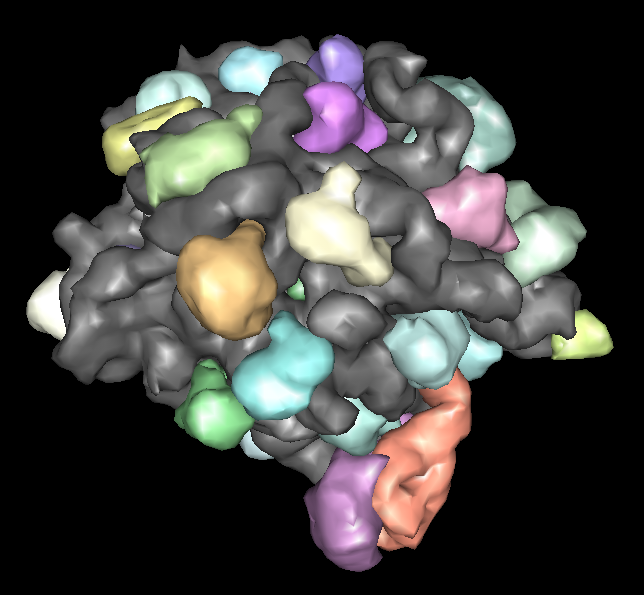 There are 8 large ribosomal subunit structures and several other partial structures in PDB. Different structures have bound anti-biotics, or protein synthesis intermediates, or are from different species. Low-resolution display capability can be useful to compare these large complexes. Optimization. Currently 10 times slower surfacing than necessary. User interface to specify model hierarchy. File format to save model hierarchy. Handle EM or X-ray density maps or secondary structure models (currently only molecular chains). Surface representation for model components above chain level. Surface level of detail for individual components. 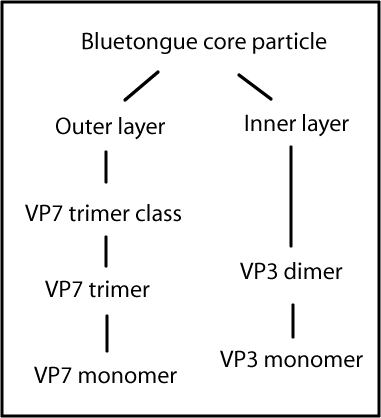 Naming of different levels of model ("outer layer", "VP7 trimer", ...). User specified representations (cylinders, individual triangles). Interact with leading edge users to guide development.